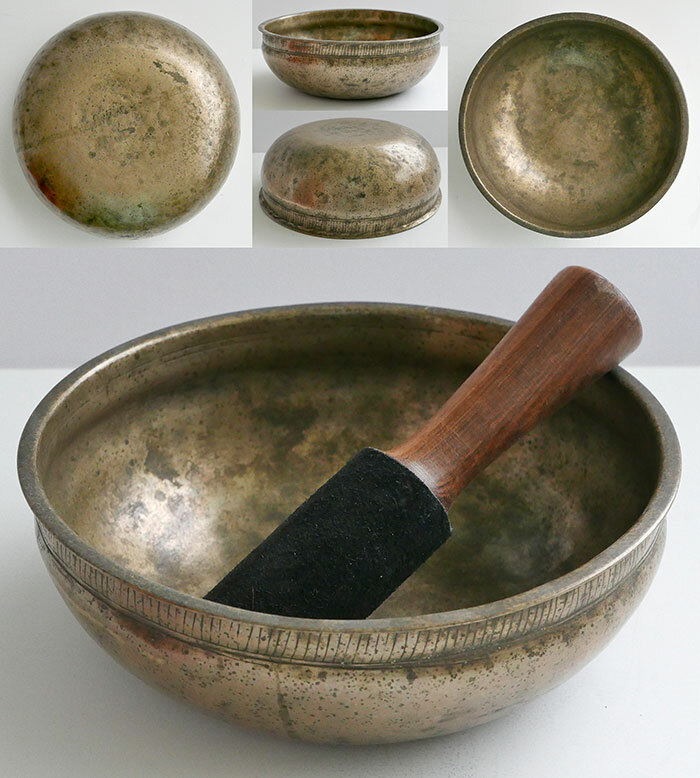 This ancient singing bowl has bags of character with its low profile, unusual form, and unique decorative features…including a flange lip, a talking mound at its centre, an unusual pair of incised lines encircling the inner rim, and an extremely rare decorative collar of vertical lines below the outer rim. The fundamental note is a third octave G# (204Hz) when struck with a padded mallet, and a fifth octave Eb (615Hz) when played around the rim with a wooden ringer. This bowl also has an excellent talking voice when struck and rocked with a little water inside. This bowl is in excellent structural condition and is supplied in its original ‘as found’ condition, as to clean and polish it would destroy much of the look and feel of its antiquity. It has a beautiful deep golden bronze colour. A Tibetan silk brocade bowl cushion and a double-ended teak and suede ringer are included in the price.